It’s a fickle business trying to predict college football games. Last season, I predicted the Ducks would got 10-2 then win the Alamo Bowl. Many bashed me and called me a hopelessly optimistic Duck fan, which I found humorous, considering those close to me know I’m much more of a Negative Nellie when it comes to my Ducks. Many saw the Ducks as a five- or six-win team last year, to which I rebutted, “Perhaps if Helf was still coach.” So, they went on and won seven. 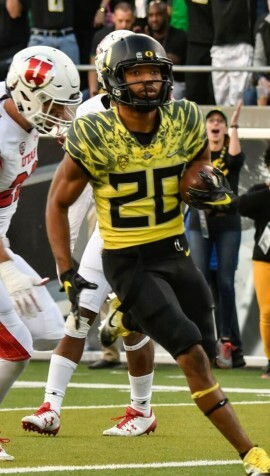 Maybe those Duck doubters were right. Naturally, I made my prediction under the assumption that Justin Herbert wouldn’t get injured. 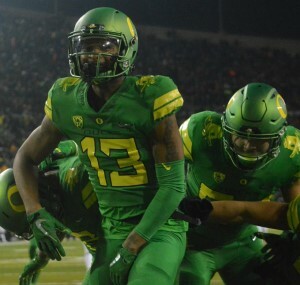 With a healthy Herbert the Ducks would have won nine games last year, possibly ten. In spirit, the Ducks were much closer to a 10-win team than a six-win team a year ago. Because of this, because I believe the Ducks will be better than last year, and because I refuse to give up on my ten-win thing, I’m predicting 10-wins AGAIN this season. 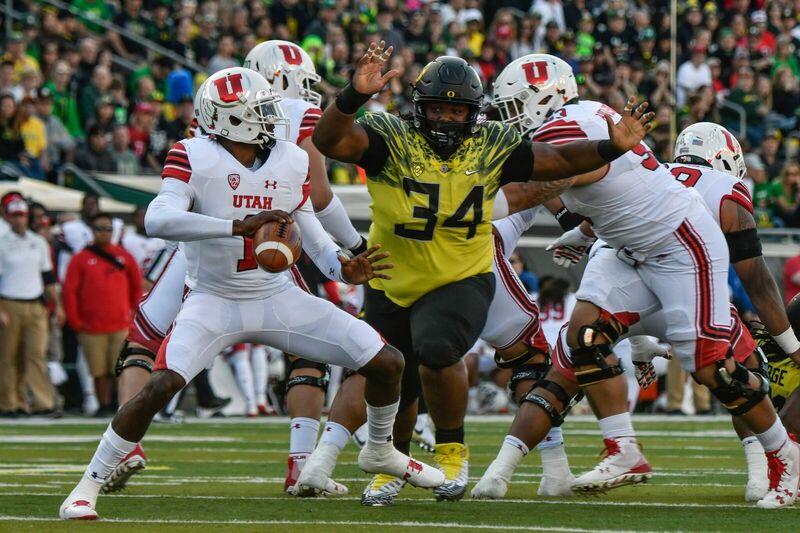 The schedule lays out near perfectly, last year’s much improved defense will be even better, and Herbert will be better protected and a year wiser. Expect a big year from Tony Brooks-James. That leaves two losses. The obvious picks would be Washington and Stanford. But I’m predicting a split with those two teams. Which means I must pick one mystery loss. A game the Ducks may be favored in, but then life happens. Could be injuries, an off week, a comedy of errors or a lesser opponent who just wants it more on that given Saturday. Better win or heads will roll. Went 2-6 in the Mid-American conference last year, 2-10 overall. Our favorite punching bag from the north went 0-11 last year. But they also almost beat the Beavs last year and should have won. As a kid in 1983, I recall watching the Ducks play a rare live television game. I was so super exciting! Then, of course, the Ducks went out and lost 34-44. Much has changed since then. San Jose was the 2017 Mountain West cellar dweller at 1-7, 2-11 overall. Bull—t! The Beavers blow. Worst team in the Pac-12. Should cruise to victory, but if the Ducks don’t show up to play, they could get upset. The Sun Devils return only 11 starters, but two of those are quarterback Manny Wilkins and receiver N’Keal Harry. The Sun Devils have serious problems on defense, especially defending the pass. They gave up almost 33 points a game last year. Outside of Herm Edwards providing some great press conference clips, the Sun Devils are hard to predict. But that won’t stop me from predicting they will have team wide melt-down and that Edwards will lose his team by mid-season. The kind of games that define a season. These are games that on paper the Ducks are favored to win, but then life happens. These are games that, if the Ducks don’t play their best, they could lose. The Bears have an offense that returns 10 starters, including 1,000-yard rusher Patrick Laird and quarterback Ross Bowers. Last year’s defense took great strides by reducing its yards per play total from 6.7 to 5.8 and allowing only 28.4 points a game. Props to former Duck Justin Wilcox for getting the Bears headed in the right direction last year. 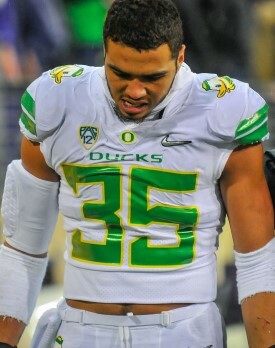 As Duck fans, we’ll cheer for him to do well … until of course the Bears become a real threat. But that’s still two years away. The Cougars are in rebuilding mode as they enter this season with a quarterback who hasn’t taken a snap and some key losses on defense. Look for the Cougs under Mike Leach to improve throughout the course of the season. The Ducks have lost three in a row in this series after winning eight straight. And if you read my little bio below next to my mug, then you know I need the Ducks to win, and big. Otherwise, I’m going to be walking around Spokane with a brown (paper) bag over my head. With nine returning starters on defense and new Coach Kevin Sumlin, the Wildcats will be an energized group this fall. Pair that with key misses in Washington and Stanford, and they have the easiest path to the southern crown. Dillon Mitchell and the receivers should be an improved bunch. Khalil Tate became the Pac-12’s most exciting player when he burst on the scene with 1,591 passing yards, 1,411 rushing yards and 26 total touchdowns in 2017. But, take away the run and force him to pass, and he looks the part of a very mediocre college qb. Junior quarterback Tyler Huntley is poised for a breakout year, and, even though only four starters are back, Kyle Whittingham’s defense will be solid once again. November games on the road in cold climates against well coached teams that play good defense often have disaster written all over them. Here’s to me being dead WRONG. The Bruins enter fall practice with uncertainty at quarterback, question marks on the line of scrimmage on both sides of the ball. They also have concerns surrounding a defense that gave up 36.6 points a game last season. That was also 2009, when Chip was light years ahead of everyone in offensive scheming. Not so much anymore. Expect Chip to be a solid coach at UCLA and right the program, but his days of working miracles are over. 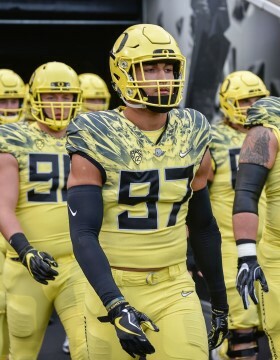 Jalen Jelks will be looking to raise his draft stock while leading the Ducks to victory. Stanford returns Heisman Trophy candidate Bryce Love, one of the nation’s top offensive lines and Quarterback K.J. Costello, who should be even better this year. But the Cardinal have questions on defense after several key losses and a porous run defense in 2017. If this game was at Stanford, I’d give the Cardinal the edge. This game will be the Ducks first tough game of the year, and expect them to rise to it as Autzen is a-rockin’. As much as it pains us to believe it, the Huskies are currently the Pac-12’s flagship program, and you can’t supplant the best until you prove it on the field. Whereas some would have been content with a six-win season last year, six wins in 2018 would be an unmitigated disaster. In most years this team would be considered an eight- or nine-win team. But with the super easy non-conference slate, no USC, and their toughest games at home, the schedule is the Ducks’ best friend. The Ducks would be wise to capitalize on this as things get much tougher next year. Whereas last year the Ducks were better than their record, this year’s team could be a very good team that isn’t as good as their record. That is, of course, if things go according to my master plan, as it almost always does. I mean, just look at last year (wink-wink).